Pejac, Line, Acrylic on wall, Valencia, 2014. 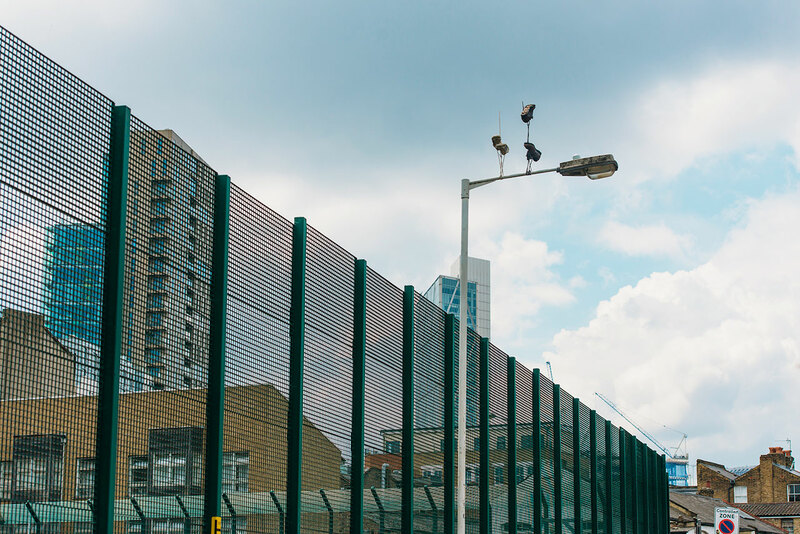 “LAW OF THE WEAKEST” at the Londonewcastle Project Space in London is the much anticipated first solo exhibition by the Spanish, multi-disciplinary and famously aloof artist known as Pejac. Featuring new work from the past two years, including paintings, sculptures and installations, the show tackles social and environmental issues though a unique poetic language that, as its title suggests, is both thoughtfully funny and earnestly sad. 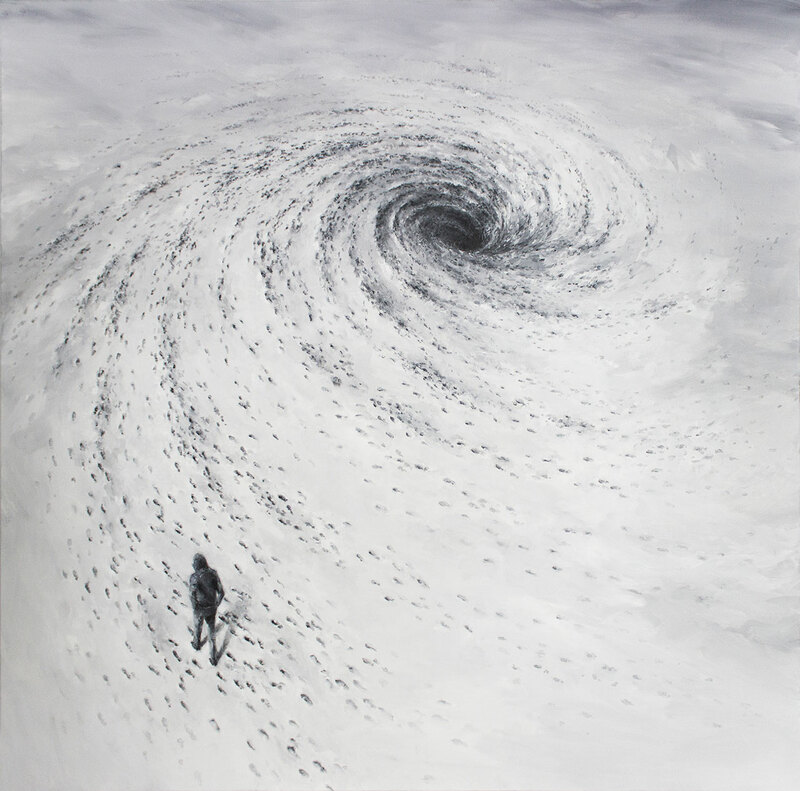 Pejac, Black Hole, 150 x 150 cm, Oil on canvas. Pejac, Wound, 81 x 100 cm, Oil on canvas. Pejac, Scales, 162 x 81 cm, Oil on canvas. Pejac, Bunker #3, 42 x 42 x 14 cm, Mixed Media. Best known for his street art—which is self-produced and independent from his gallery— Pejac’s work merges melancholy and humor in what can best be described as visual poetry. He uses mundane, quotidian concepts in surprising and unexpected ways to reveal something beyond their apparent reality, to discover, as he explains, “the hidden side of everything”. 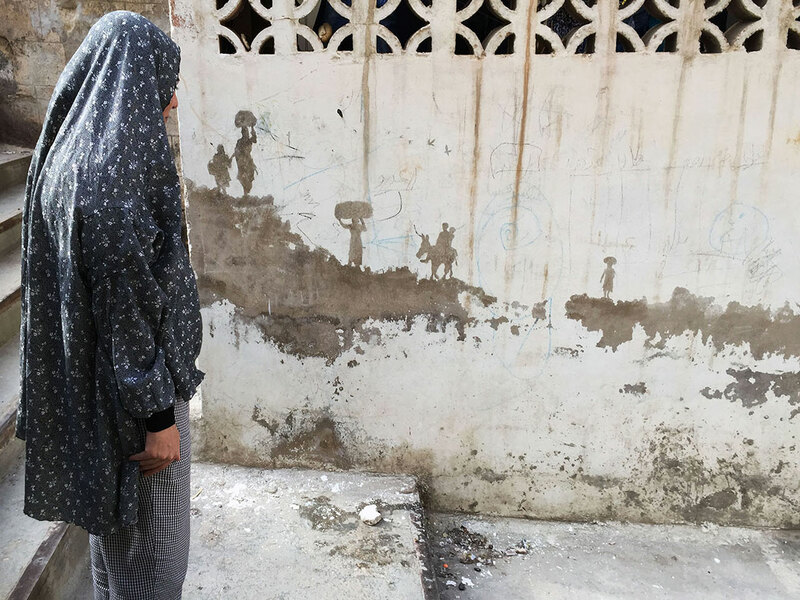 A man with a broom, for example, sweeps the dust of his own disintegrating self (“Dust”, graffiti in Santander), a window seems to be peeling off the wall (“Blind Window Series”, graffiti in Istanbul) and the world goes literally down the drain on the side of a street in Santander (“Stain”). Quirky as they may seem, this sense of surrealism running through his work “is not intended to denounce the importance of the issues” he stresses, but is “a way to soften them”. 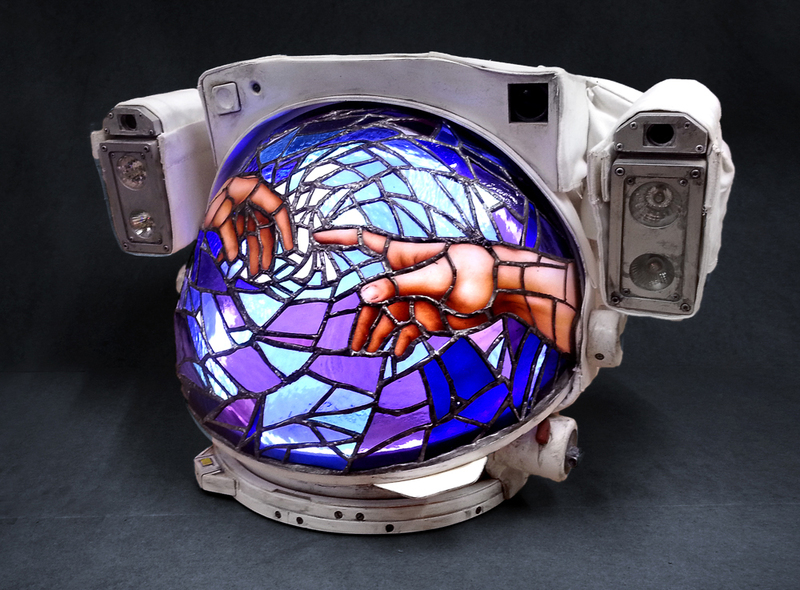 Mixed media and hand made stained glass. 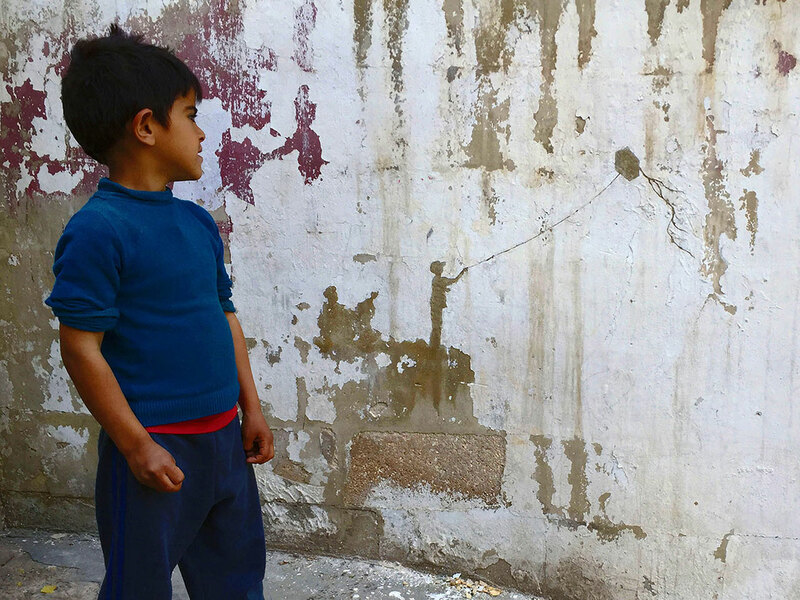 Pejac, Kite, Al-Hussein Palestinian, refugee camp, Amman, Jordan, 2016. Pejac, Migration, Al-Hussein Palestinian, refugee camp, Amman, Jordan, 2016. Pejac, Throne, Al-Hussein Palestinian, refugee camp, Amman, Jordan, 2016. 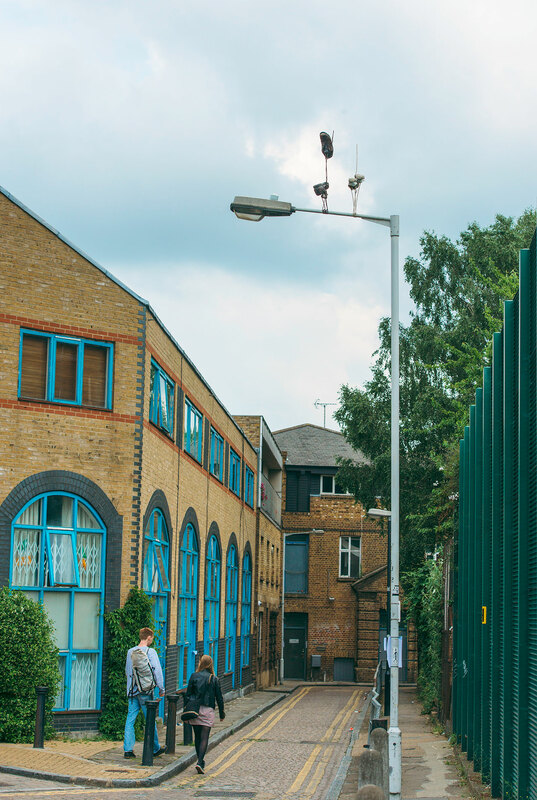 The London show is preceded by “Downside Up” a series of street installations in Shoreditch where several gravity-defying sneakers are seen hanging from lamp posts dangling up, not down, both a reference to the distorted state of the world and a prelude to the exhibition's upended perspective. 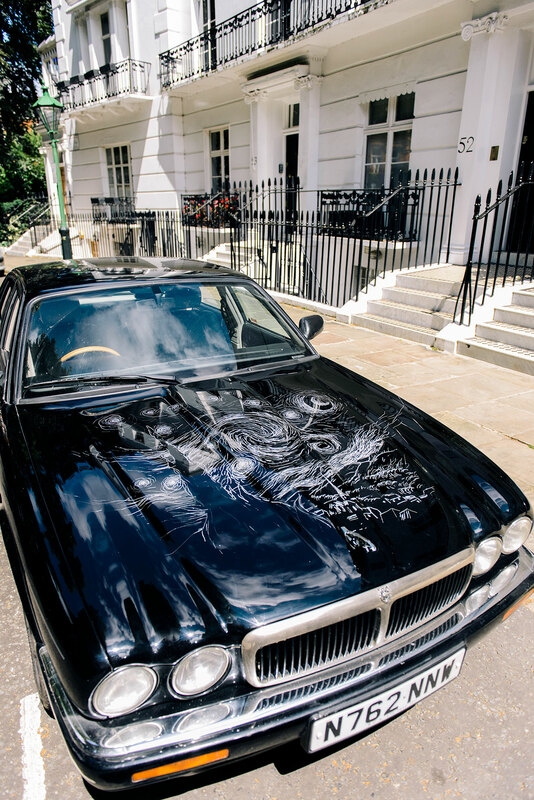 Also part of this “preview” is “Don’t Look Back in Anger”, a piece responding to the divisive nature of the recent Brexit vote whereby the artist has recreated Van Gogh’s “Starry Night” by scratching the hood of a Jaguar, the quintessential British car, to convey the human urge to turn our scars into something positive in order to heal them. 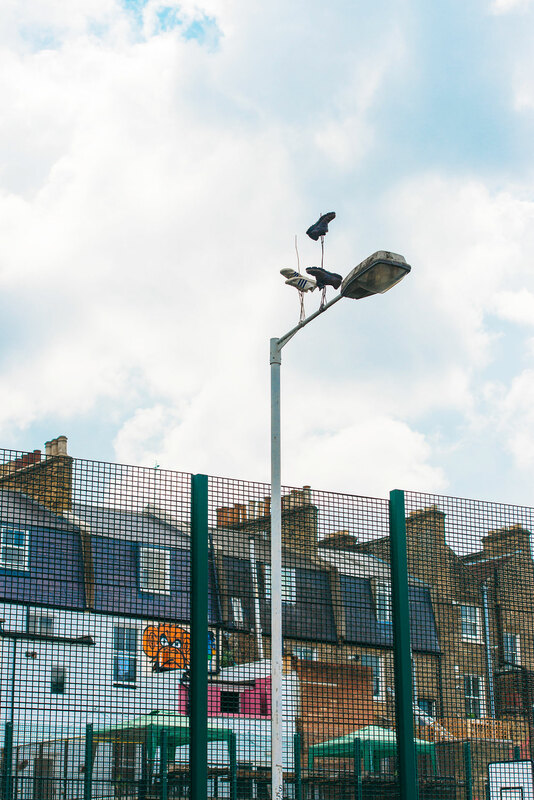 Pejac, Downside Up #1, East London, United Kingdom, 2016. Photo by Gary Van Handley. 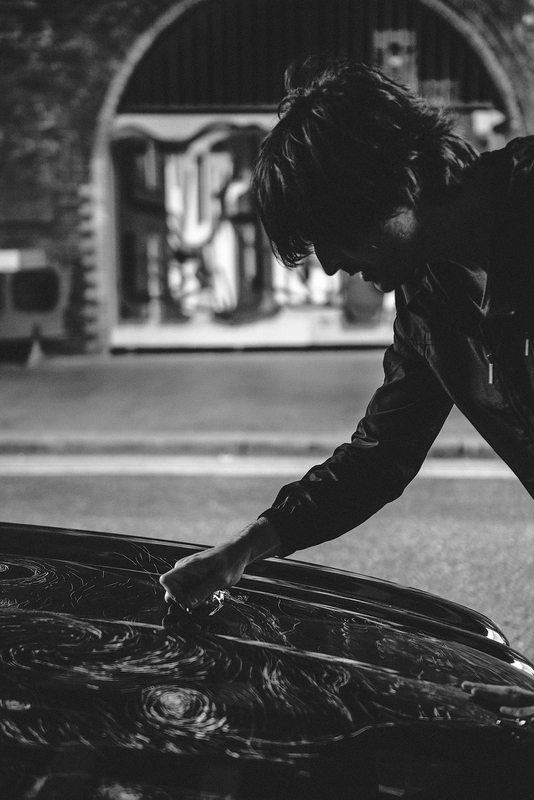 Pejac has said very little about the show itself—preferring the “artwork to speak for itself” as he succinctly told Yatzer—other than to express a sobering feeling, noting that “the impossible ideas or situations [that my work depicts] end up becoming real, despite how improbable or bizarre they seemed while painting them”. 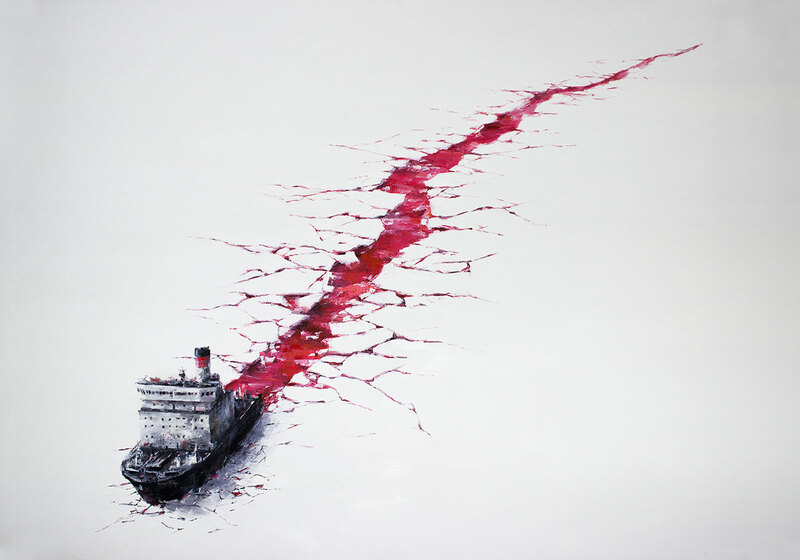 “Herida”, for instance, an acrylic on canvas, that depicts an icebreaker plowing through ice leaving a trail of blood behind, may well be referencing the environmental havoc that humans have wreaked on the ecosystem but also brings to mind the countless number of refugees that have drowned at sea. Other paintings present a world disdainful of culture, where a piano is turned into a dumpster (“Dumpster”) or a vast rubbish damp containing, upon closer inspection, books. It is by confronting the issues that “define the world we live in” in a satirical fashion, far from trivializing them that makes them more visible. 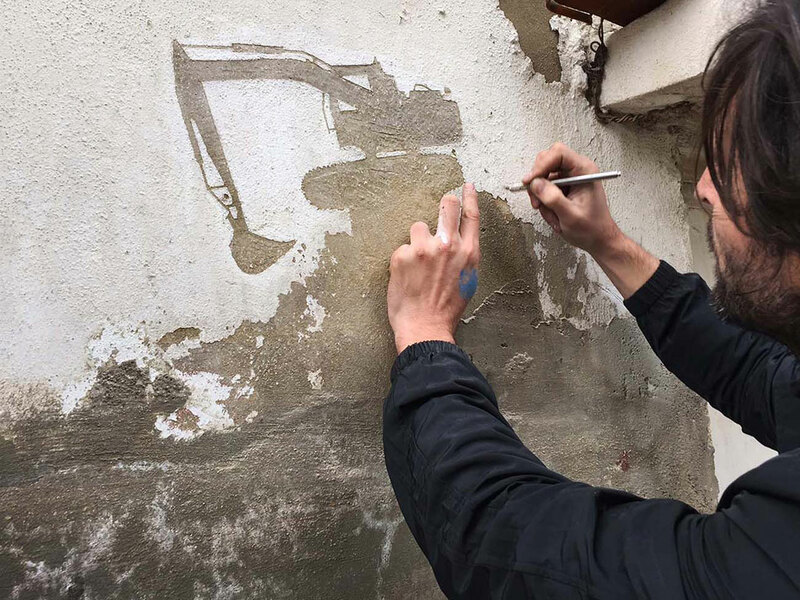 For Pejac, “art it is not a way to escape from the world’s conflicts but to actually connect with them". 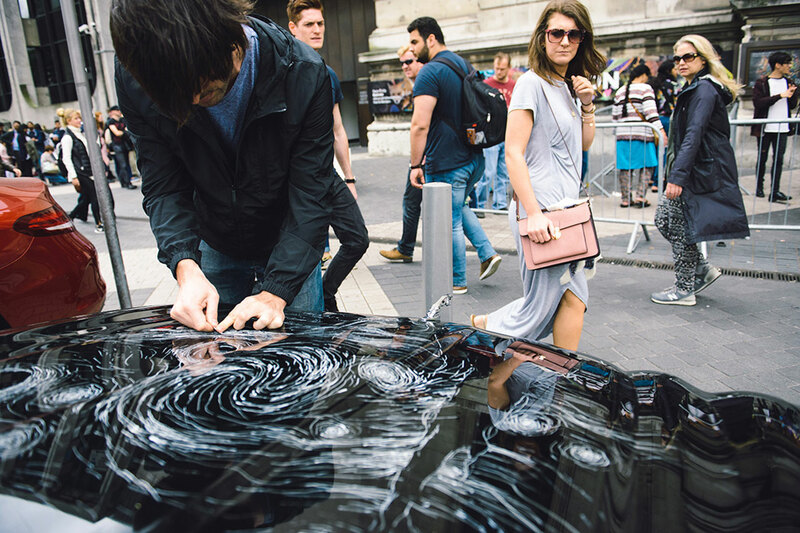 Pejac, Don't Look Back in Anger, London, United Kingdom, 2016. Photo by Gary Van Handley. Like the paintings, the exhibition’s sculptures also toy with conflicting ideas through a surrealist perspective. 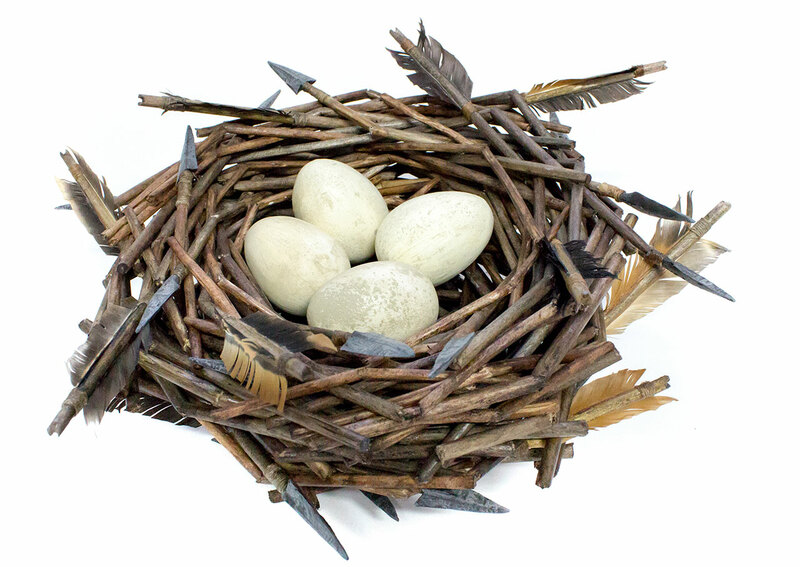 So in “Bunker”, we see a bird nest made out of broken arrows holding something as fragile as eggs whereas in “Faraway So Close”, a spacesuit helmet is fitted with a stained glass visor depicting a detail from Michelangelo’s fresco in the Sistine Chapel “The Creation of Adam”, a poetic symbiosis of science and religion, technology and art. By merging contradictory or incongruous elements in a tentative union, Pejac engages viewers in contemplation as they attempt to “resolve” the visual dissonance that they are looking upon. Be prepared, “LAW OF THE WEAKEST” seems intent on twisting your perception of reality and the reason seems clear: to make us aware that we are conflicted beings living in a conflicting, multivalent world, and to come to terms with this reality is the key for a better future. Pejac, Don't Look Back in Anger, London, United Kingdom, 2016.